The Philadelphia Visitors Channel presented Mgsr. Arthur E. Rodgers, rector of the Cathedral Basilica of SS. Peter and Paul, with two awards Monday, Feb. 18 for a video on the cathedral. The video presents a tour of the cathedral that highlights its spiritual and historic significance. Considered the mother church and iconic symbol of the Archdiocese of Philadelphia, the cathedral was constructed beginning in 1846. Major renovations inside and outside the cathedral were completed last year. 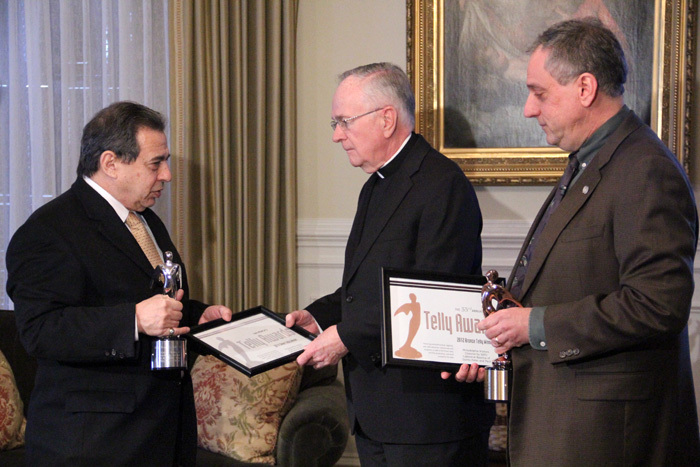 Votes from viewers on the Internet helped the cathedral video win the People’s Telly Silver Award, a first-place award, in the non-broadcast Travel and Tourism category. The Bronze Telly was awarded in a judged cialis competition. Learn more about the Cathedral Parish here.